When you are starting out as a Reiki practitioner, or looking to develop your practice further, it can be a bit intimidating to think about putting together a Reiki leaflet to advertise your treatments. What do you say? How should you lay out the information to make it attractive? How do you start? We have tried to assist people in this, and take away all the hassle, by making available some designs of Reiki leaflets that you can use to promote your treatments and Reiki courses simply and easily. 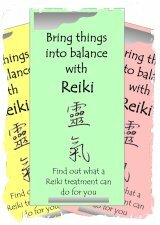 The leaflets are professional, attractive and explain Reiki clearly and succinctly. The Reiki leaflets are based on the “A4-folded-into-three” format (paper size 210mm x 297mm) and we will post the CD-ROM anywhere in the world. You can print out the Reiki leaflet templates straight away using your computer and desktop printer, or you can take the CD to your local printer if you need a larger number of flyers. Alternatively, you can download the leaflets straight onto your computer now, and get going with your new leaflets right away. The Reiki leaflets appear on the CD-ROM as MS Publisher98 files and a PDF files. You can use these templates, and your desktop printer, to print out your own leaflets onto plain or pretty coloured paper, or you can take the PDF file to your local printer to be printed on the paper stock of your choice. If you have MS Publisher on your system then you will be able to edit the leaflets. The PDF files are not editable. For all the Reiki flyers there is a space left blank on one section for you to write your contact details, or place an address sticker, or for you to print your name and contact details: we have provided a MS Word template for you to use to print your details on each leaflet in the right position. Price includes VAT at 20%. To order your CD-ROM you can use the payment buttons below. This item is GUARANTEED so if for any reason you are unhappy with it, return it to us for a full refund. To download the leaflets onto your computer now, you can use the payment buttons below. This item is GUARANTEED so if for any reason you are unhappy with it, you will receive a full refund. Here you can read further testimonials from people who have purchased our Reiki Leaflets CD-ROM. “The CD is great! more than one format is useful and the fact that you have already got the templates to use or adapt saved me so much time. You’ve made a better job than I probably would have anyway: simple, to the point and easy to understand. I have printed some off and given them to the people I treat locally for their feedback and for them to pass on to their friends too. They love them. They said the level of information was pitched just right. “THANK YOU SO MUCH for the CD. It has been a huge help, as I have been struggling for a while with the content of a Reiki leaflet (I do several therapies and have one leaflet which briefly covers all of them, but wanted a separate leaflet which gave more information on Reiki) and now I have one!